How clear is your company’s financial picture? If your finances feel murky, you’re not alone. Uncertainty about the financial future is one of the top 3 challenges of running a U.S. small business. 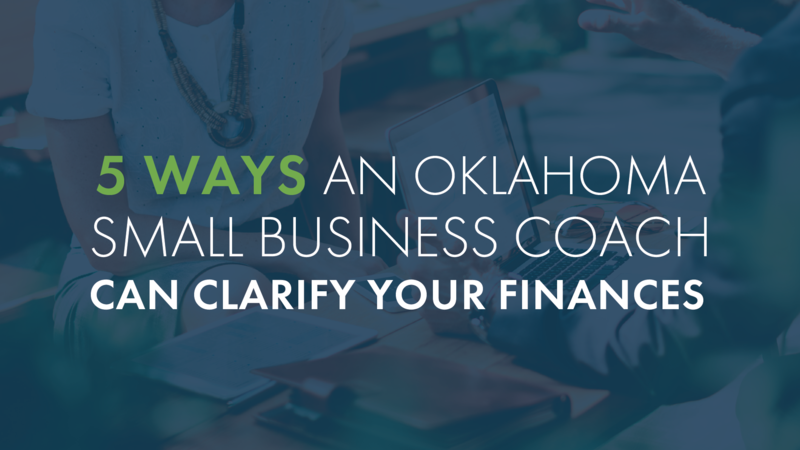 An Oklahoma small business coach can add clarity to your financial forecast. They’ll help you strategize, prioritize, and find a clear path forward for years to come. Here are 6 ways a coach can give you a deeper look into your finances. Cash flow problems are the cause of 82% of small business failures. Many small business owners forget that cash flow isn’t just about how much money is moving through your business, but when. Your cash flow is a timing issue - and it all comes back to your budget. When you set last year’s budget, how accurately did you plan for today? Were your projections off the mark? What’s preventing you from staying on budget? A small business coach can help you budget more effectively and prevent massive ups and downs that put your business in jeopardy. Before you make next year’s budget, consider getting some help from an expert. If your small business coach is a CPA and has a background in accounting and tax preparation, they’re in a great position to give helpful tax advice. You could be missing out on thousands of dollars in tax deductions and savings that come from restructuring your business. The U.S. General Accounting Office found that 71% of the nation’s taxpayers benefit from using professional tax preparation. The main reason is that doing your taxes is complicated - especially for small businesses. The average small business owner spends 3 to 10 hours on tax issues per month, and about 40 extra hours at tax time. When your small business coach is a CPA, you can turn this task over to them and focus on your core business. Is your business growing? During a time of expansion, your finances can become more challenging. The company is bringing in new customers, orders, equipment, and employees. You need more space. Maybe you need to find new investors. Everyone has a million questions. There’s not enough time to do everything. A small business coach can help you keep an eye on the details during this busy time. They can also remind you about the bigger picture and ensure your expansion stays totally on track. Uh oh. You have a legal problem. You’ll need to hire an attorney, but a small business coach can also be a big help. When a legal issue arises, a small business starts scrambling. Suddenly your days are filled with tense conversations, legal paperwork, and back-and-forth communications among all the parties involved. It’s overwhelming. Turn to your small business coach to help you see a secure future during and after the situation. Most routine legal matters take about 3 to 6 months to resolve, although injury cases sometimes take 1 to 2 years. Lean on your coach to get you through it all. Here’s a benefit you might not have considered. A small business coach can help you understand your company’s metrics and analytics. For example, do you track how much time people spend on your website? Or how often they abandon their online shopping cart? What’s your customer conversion rate? How’s your churn? If these questions drive you nuts, you need the help of a small business coach. With their years of business experience, they can determine which metrics are most meaningful for your company. You can focus on those, and improve your decision-making for a better future. Ascension CPAs & Consultants is a full-service Oklahoma small business coaching company that handles accounting, bookkeeping, payroll, taxes, planning, and business consulting. We can reduce the tax burden your company faces and provide business coaching services with a personal touch.